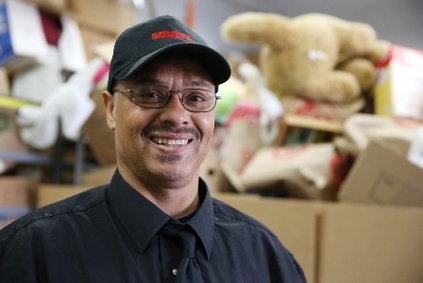 Kevin found a job at Savers through Hennepin Health’s supported vocational services program with RISE, Inc.—one of Hennepin Health’s 2013 reinvestment initiatives. To learn more about the supported vocational services program, check out this video. One of Hennepin Health’s innovative features is the reinvestment initiative, projects that are initiated with a portion of Hennepin Health’s year-end budget (known as “risk sharing dollars”). These projects fill social, behavioral, and medical gaps in the system. The hope is that reinvestment initiatives will yield additional cost savings by improving health care quality and diverting members from costly crisis care. These cost savings, in turn, will allow Hennepin Health to fund additional reinvestment initiatives. Examples of reinvestment initiatives launched in 2013 include an emergency department in-reach program with Spectrum and a supported vocational services program with RISE, Inc. In late 2013, leaders from Hennepin Health partner organizations submitted a variety of reinvestment initiative proposals. Proposals were evaluated on their potential to yield a return on investment, to be financially sustainable beyond one year, and to support Hennepin Health’s strategic goals (e.g., decreasing emergency department and inpatient admissions, increasing primary care visits). Co-locating an access clinic within HCMC’s Coordinated Care Center. The access clinic will provide services such as transition management, follow-up after hospital discharge, intake and assessment, emergency department diversion, and primary care. Launching a program at NorthPoint Health and Wellness Center that expands outreach efforts, increases oral health visits, and links members to primary care and care coordination services. Hiring five additional community health workers to engage in outreach, provide health education and counseling, and connect members to primary care. Those workers will be assigned to designated locations, including Health Care for the Homeless, Metropolitan Health Plan, and the Access Clinic in HCMC’s Coordinated Care Center. Extending Hennepin Health’s current supported vocational services program with RISE, Inc. by six months. The program provides career counseling and job placement services to Hennepin Health members with a history of behavioral health hospitalizations. Faciliating dedicated “huddle time” at HCMC’s Medicine Clinic, where providers meet to craft plans to improve population management and patient quality of care. Funding a care coordinator position at HSPHD's Mental Health Center. 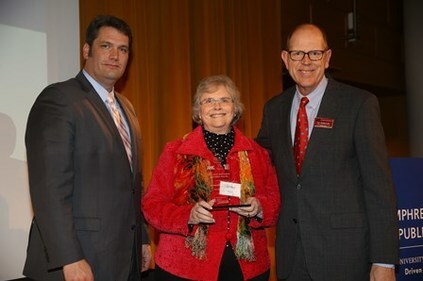 In the picture, above, Linda Berglin (center), Hennepin County public policy and program manager, accepts the Local Government Innovation Award on behalf of Hennepin Health. The Humphrey School of Public Affairs at the University of Minnesota recently honored Hennepin Health, as part of an effort to recognize smart local government initiatives, through the Local Government Innovation Award. Hennepin Health was among 94 local government agencies judged by a panel that included representatives from the Humphrey School, Bush Foundation, the League of Minnesota Cities, the Association of Minnesota Counties, and the Minnesota School Board Association. Contestants were evaluated not only on their creativity in redesigning the system, but also in how effective their efforts have been. Out of the contestant pool, 18 entities were selected. Staff were honored at an awards ceremony at the Humphrey Institute on December 12, 2013. 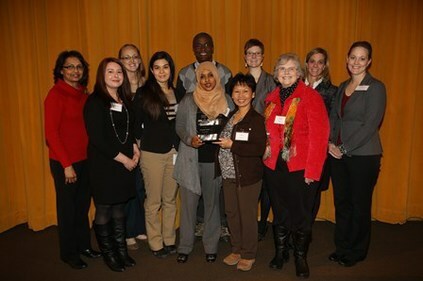 A few of the people who contributed to Hennepin Health’s success attended the awards ceremony. Back row (left to right): Sandra Kowlessar, Amy Smith, Mark Brooks, Julie Bluhm, Jennifer DeCubellis, Kristin Godfrey-Walters. Front row (left to right): Melissa Kaufhold, Lori Imsdahl, Lucky Ahmed, Kim Nguyen, Linda Berglin. Assistant County Administrator Jennifer DeCubellis played an integral role in launching Hennepin Health. Here, she addresses attendees. 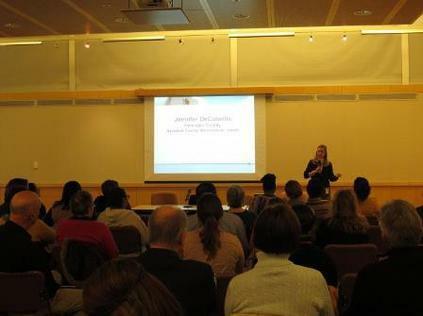 On December 13, 2013, Hennepin Health held a three-hour care coordination training at the downtown Minneapolis library. Participants included Hennepin Health partner providers and contracted providers, as well as people who just wanted to learn more about the program. Over 70 people attended. The agenda included a care coordination panel, a housing and occupational services panel, and an overview of Hennepin Health’s new intensive case management team. Three Hennepin Health members shared their personal stories with participants, detailing the ways that Hennepin Health was instrumental in helping them overcome hurdles—such as drug addiction—to improve their health and lives. Training ended with inspirational words from Jennifer DeCubellis, assistant county administrator (and former director of Hennepin Health). DeCubellis thanked participants for their role in helping to reform healthcare. She also reminded participants that continued change only comes from “speaking up,” encouraging individuals not to be silent if they think that something—big or small—could be improved. Special thanks to our speakers, including Tammara McAdory, Patrick Meacham, Martin Marty, Thomas Haselman, Jennifer DeCubellis, and individuals from the HCMC Whittier Clinic Care Coordination Team and the NorthPoint Health and Wellness Center Care Coordination Team. Hennepin Health plans to hold its next care coordination training in February 2014 (date, time, and location to be determined). If you are interested in attending, please contact Lori Imsdahl, Hennepin Health operations coordinator. ToiJya Holyfield, HSPHD social work unit supervisor, has been involved in the launch of Hennepin Health’s intensive case management team. 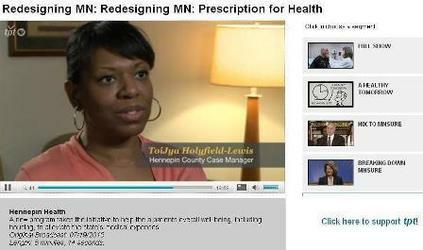 In this video, which aired on Twin Cities Public Television on July 19, 2013, ToiJya discusses her experiences working with Hennepin Health. Hennepin Health launched an intensive case management team on December 16, 2013. The goal of the intensive case management team is to provide intensive services to high service users who are experiencing significant difficulties with their lives. In order to use these services, the member needs to have a serious mental health and/or chemical health problem. To make a referral call 612-348-4111. It is essential that you identify that you have a Hennepin Health referral. This month, Hennepin Health celebrates its second anniversary. This innovative healthcare delivery program serves some of Hennepin County’s most vulnerable residents: single adults, ages 21-64, with no dependent children, who are living near or below the Federal Poverty Guideline and do not qualify for other forms of Medical Assistance. Hennepin Health began with a novel question: How do providers in Hennepin County improve healthcare quality for a subset of the population with a disproportionately high rate of homelessness, mental illness, substance abuse, chemical dependency—and other social, behavioral, and medical challenges—while simultaneously decreasing healthcare costs? It’s a timely question that is being asked by healthcare providers, policy analysts, and politicians across America. It’s a question that brought Hennepin County leaders together. Possible solutions were varied, and included using a common electronic health record, implementing a “tiered” care system that is based upon a member’s identified needs, and assigning each member a person who acts as a point of contact for that member’s social, behavioral, and medical needs--a Single Accountable Individual (SAI). Hennepin Health came about through collaboration and communication. Its continued success is dependent upon the same kind of team approach. The intent of this newsletter is to serve as a communication portal for Hennepin Health internal and external stakeholders. It will be a place where people can learn about the program’s accomplishments, challenges, current events, providers, and projects, and a channel for ideas and information sharing. Thank you for your support of Hennepin Health. Please direct questions, comments, and concerns to Lori Imsdahl, Hennepin Health operations coordinator, at lori.imsdahl@hennepin.us or 612-543-0055.